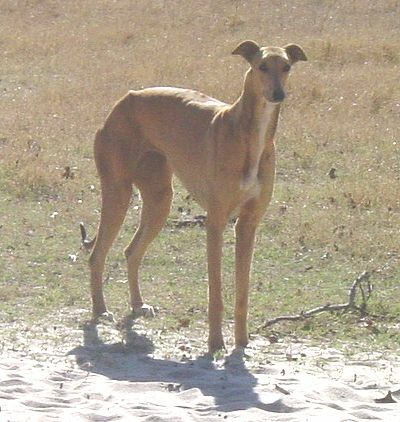 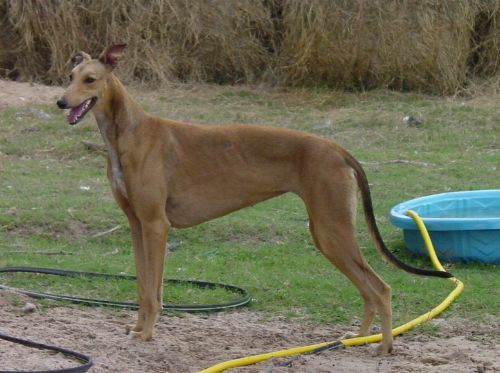 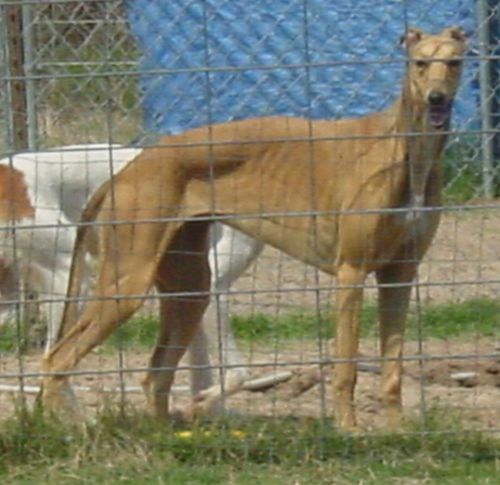 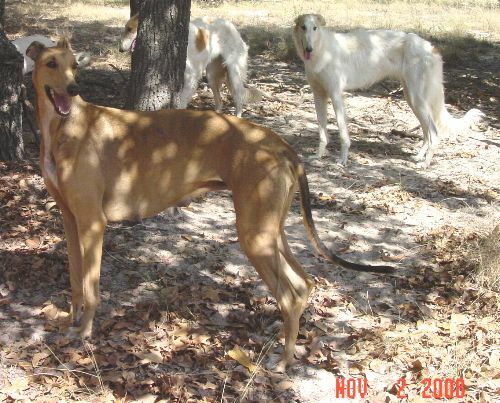 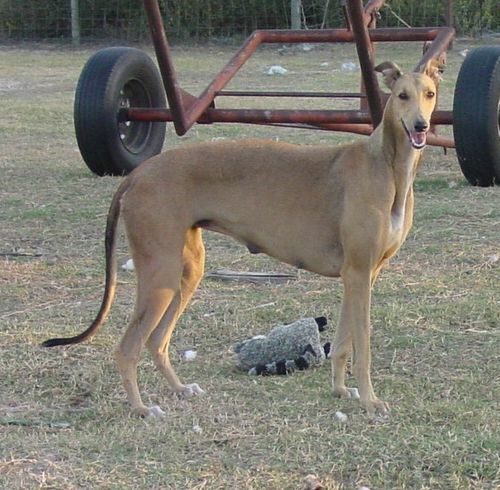 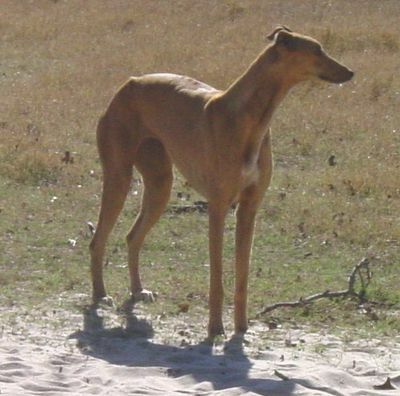 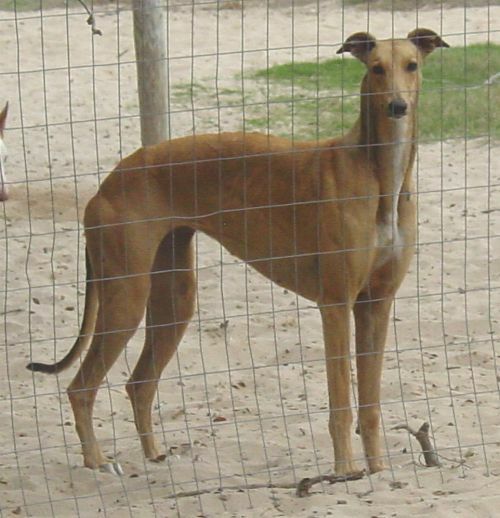 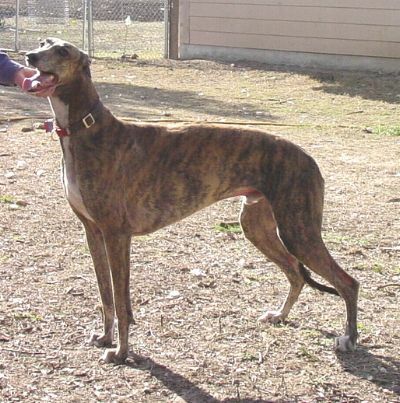 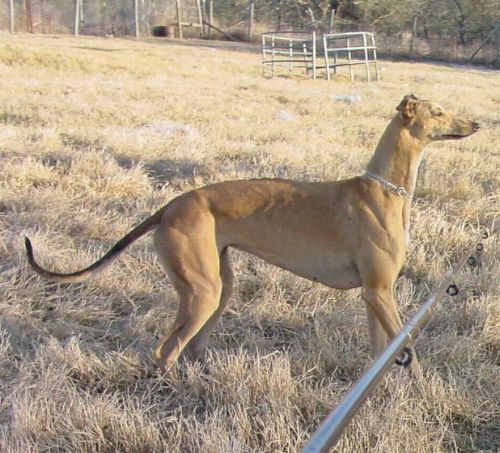 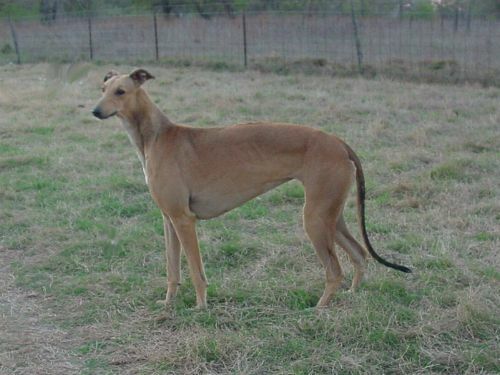 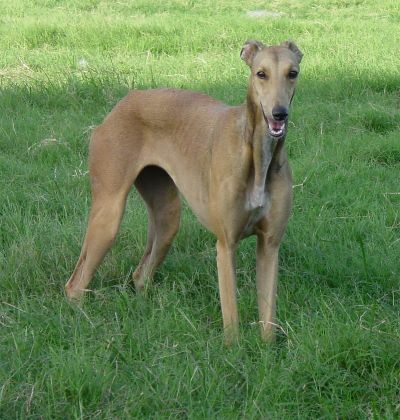 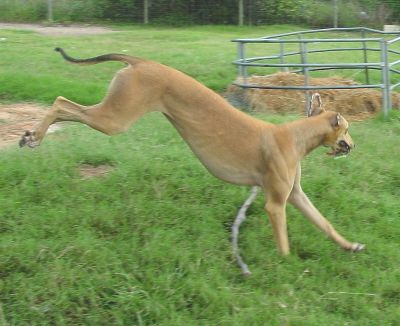 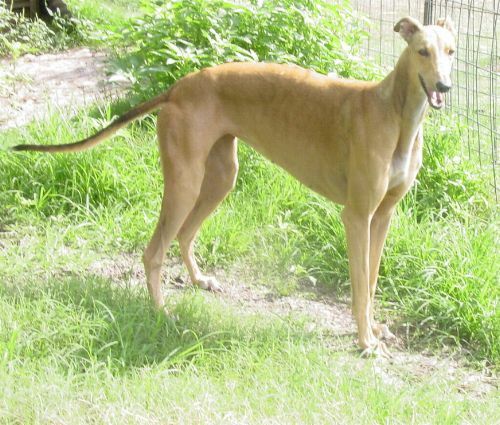 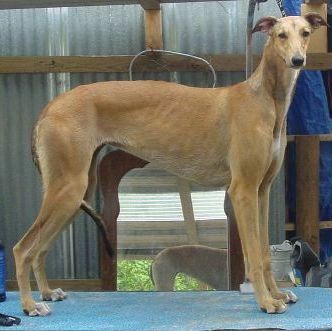 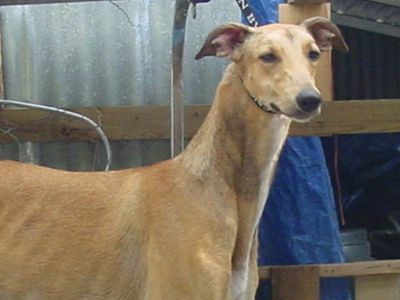 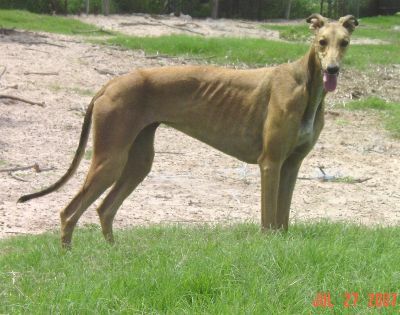 I am proud to say that Lola has been bred to Best in Field lure courser, KB's Einstein, SC, who is strong, healthy, has a great temperament, is a great lure coursing dog, and comes from the top racing bloodlines in the country, with no health issues. 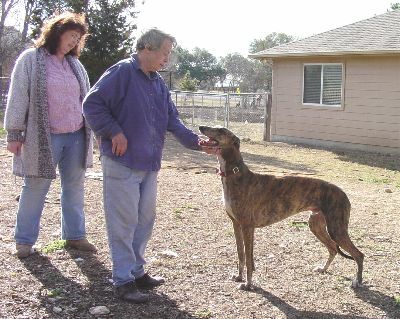 He and Lola combine the best of both worlds - Show and Racing. 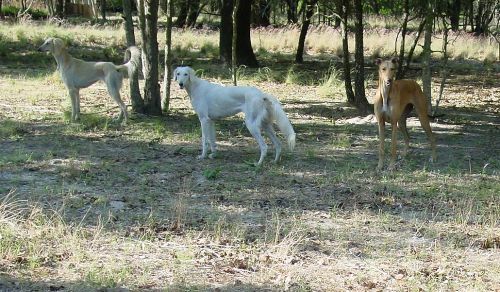 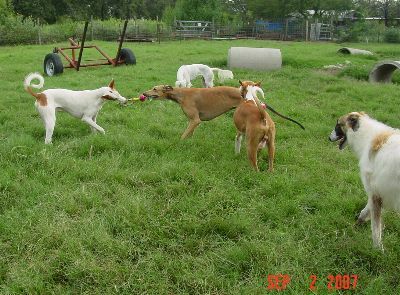 Their puppies should have "hybrid vigor" producing strong, healthy Greyhound pups with great minds and stable temperaments. 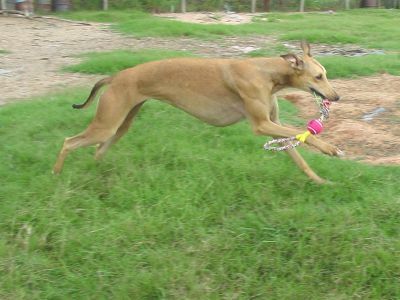 Lola is a show girl. 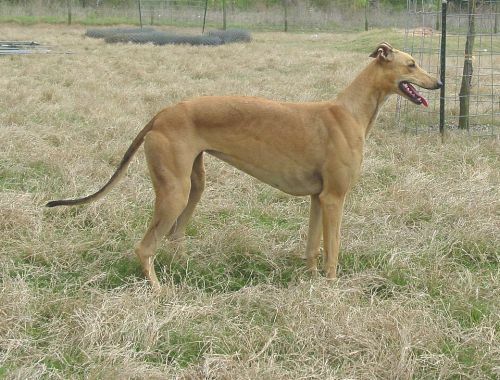 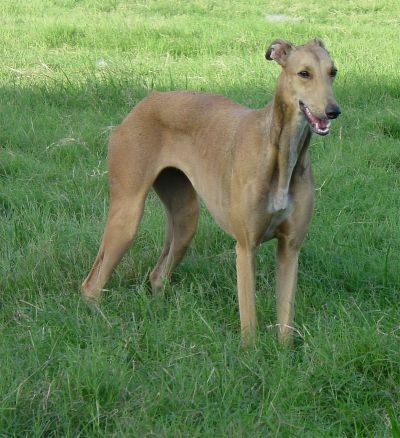 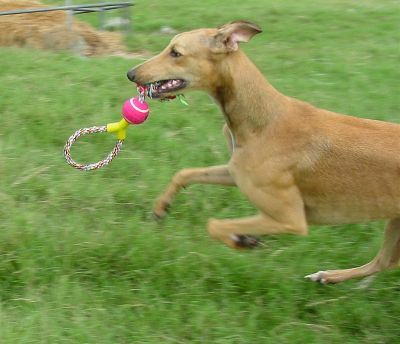 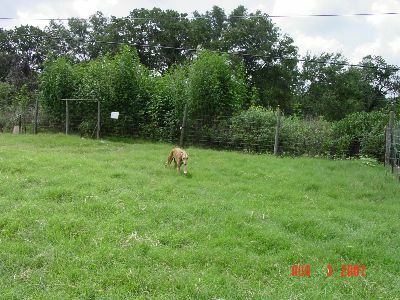 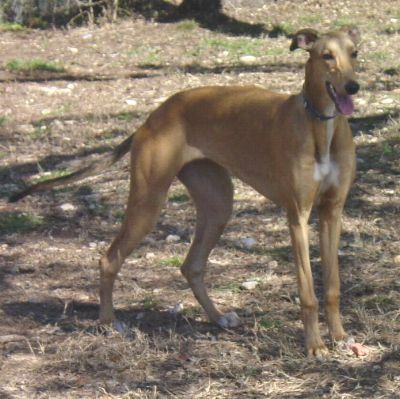 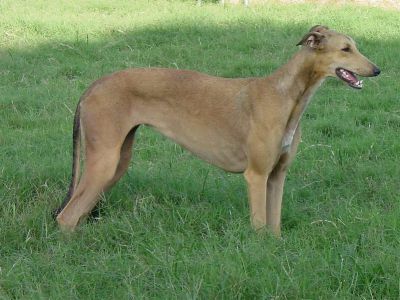 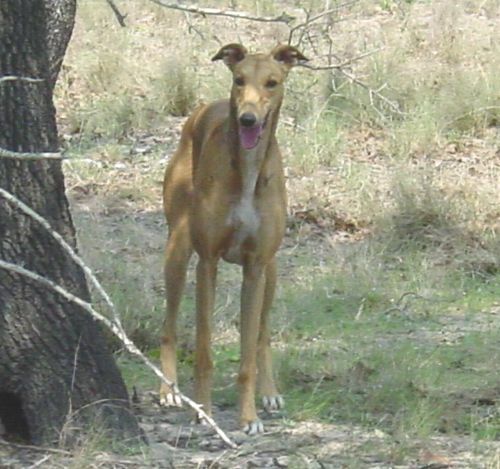 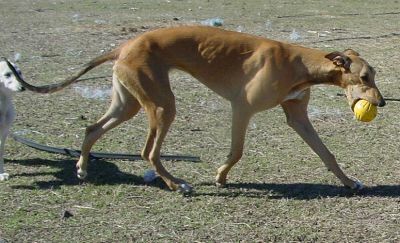 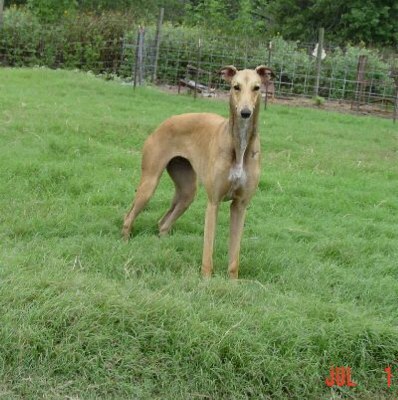 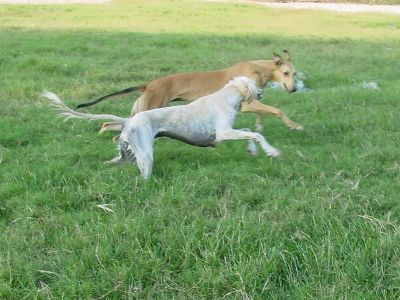 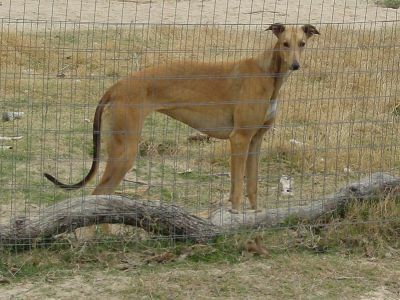 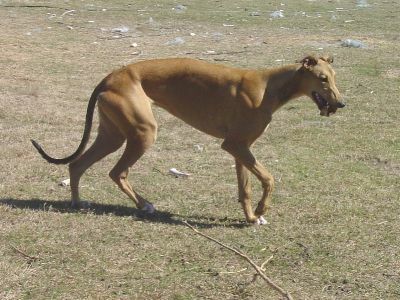 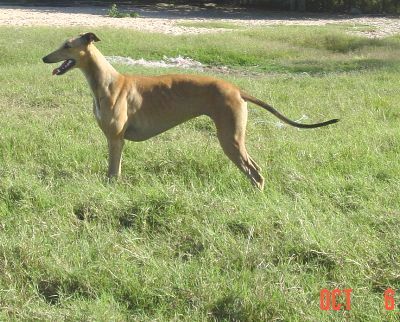 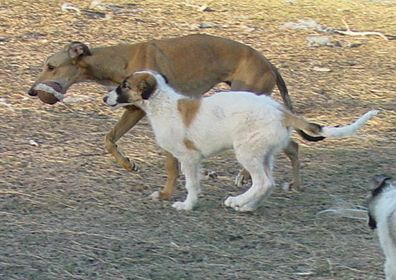 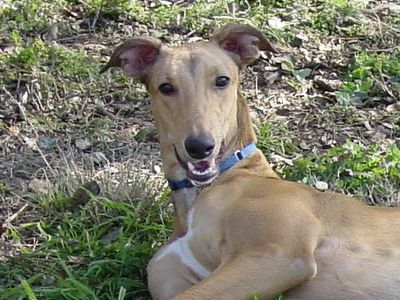 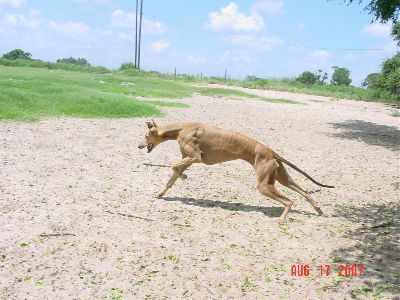 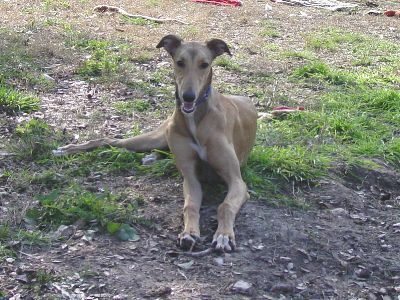 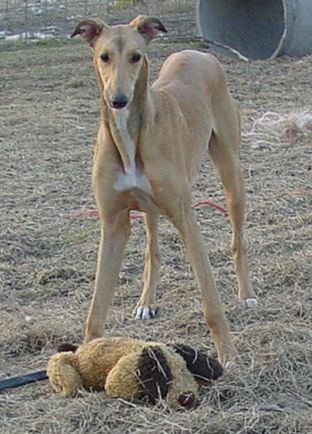 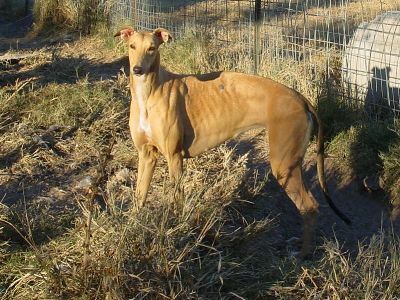 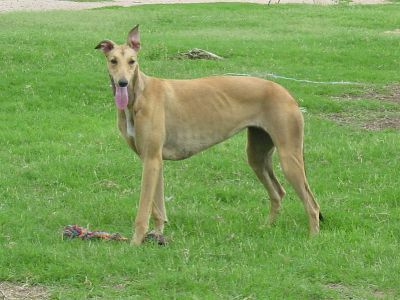 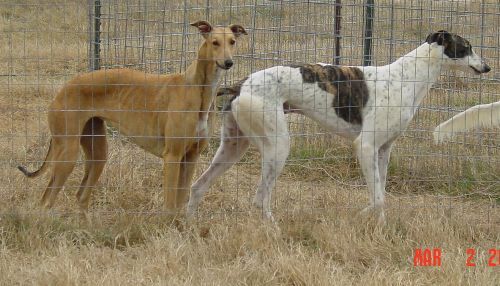 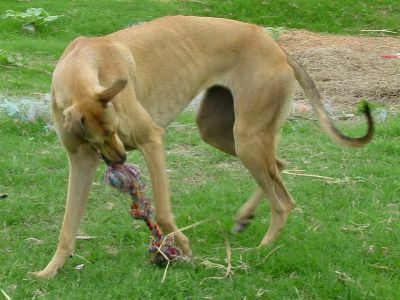 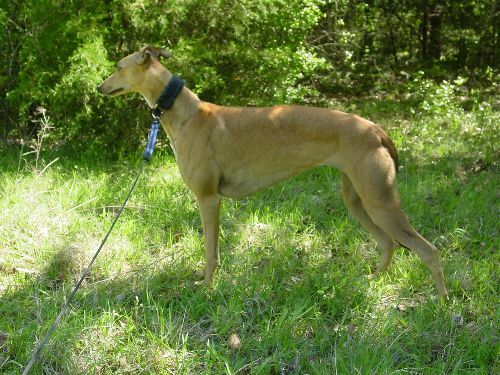 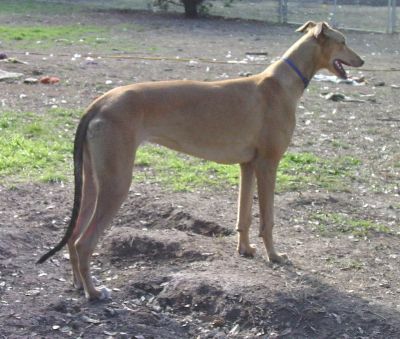 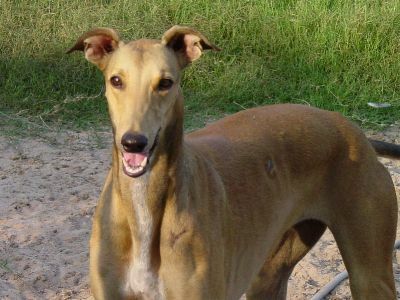 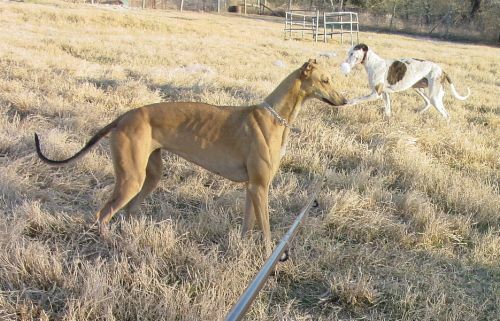 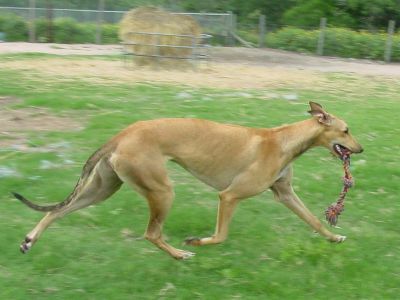 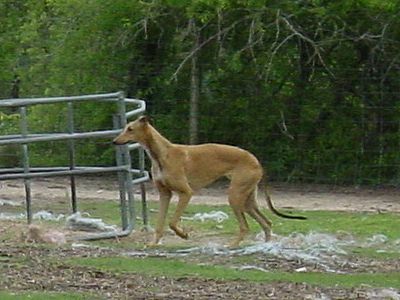 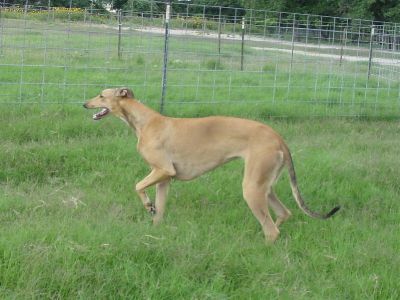 Einstein is a lure coursing boy with Best in Field under his belt. 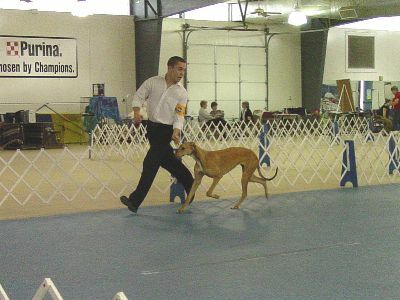 His son, Fenix, is the number one National Live Coursing Association Greyhound. 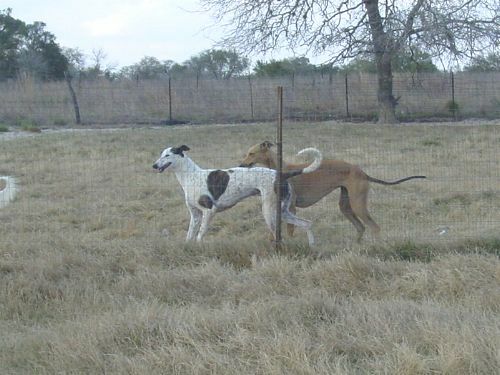 Results will be posted. 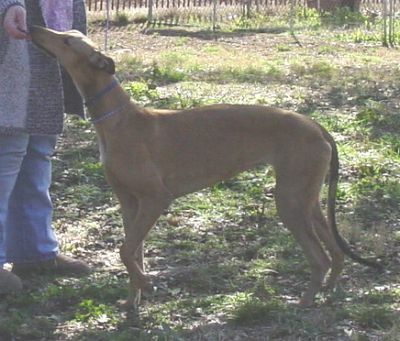 Lola was born July 4, 2006 sired by Ch. 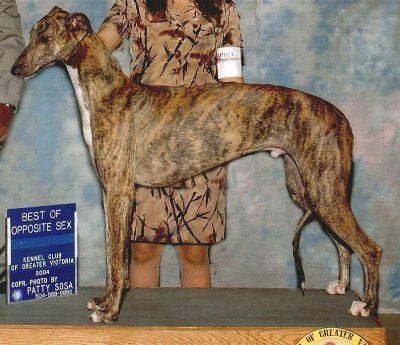 Martigras Beau Geste out of Ch. 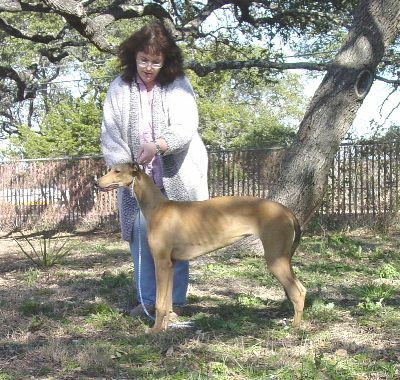 Brasspur Call Me Scarlet HM, bred by Mary Jane Peterson. 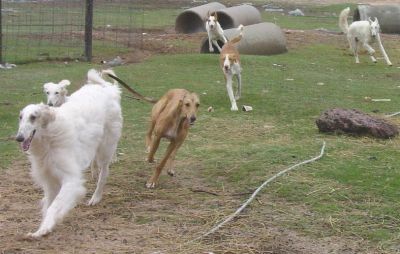 She is very happy at Shefaro with all of her new sighthound and livestock guard dog friends. 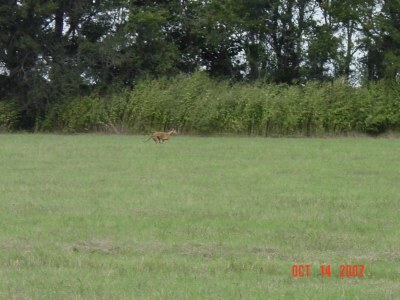 After a romp, she rested. 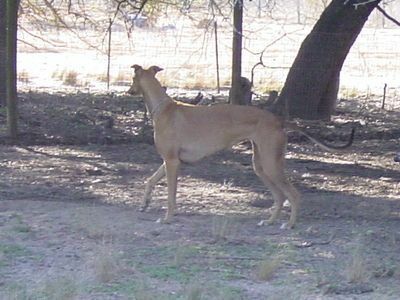 She's just gorgeous standing naturally. 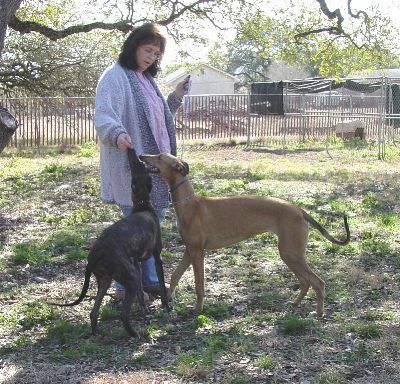 She's a natural and so correct! 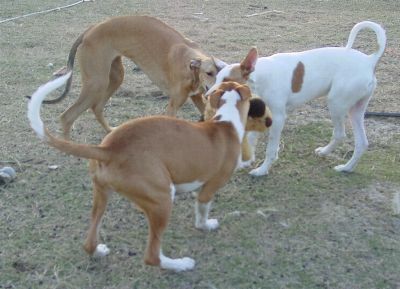 Lola and Libby playing with Stephanie. 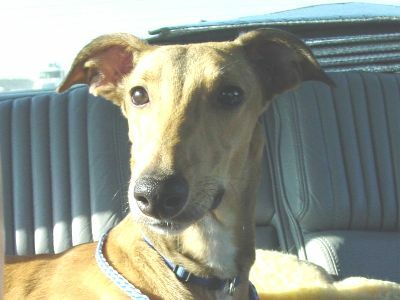 Riding in the back seat on the way home from Mary Jane's. 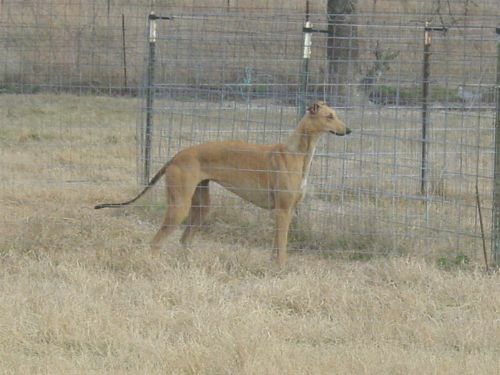 Just as pretty as it gets. 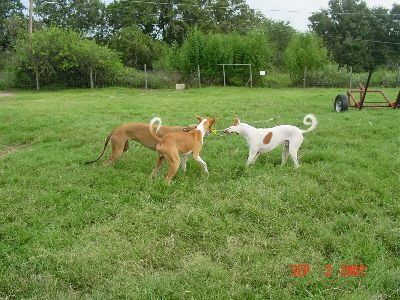 They came and got it - three way tug with Spirit and Caribe. 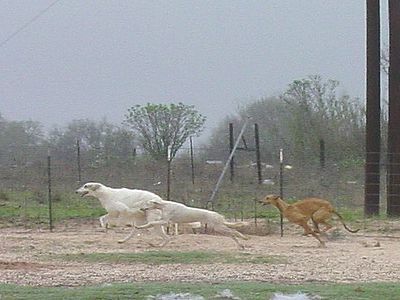 And the race is on. 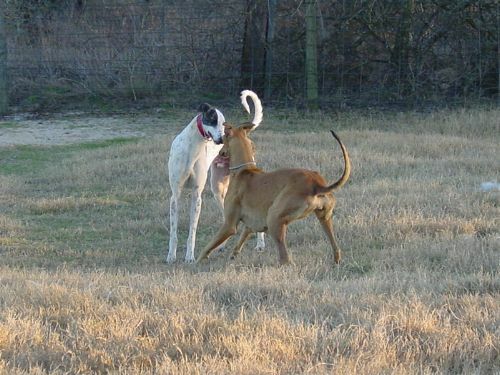 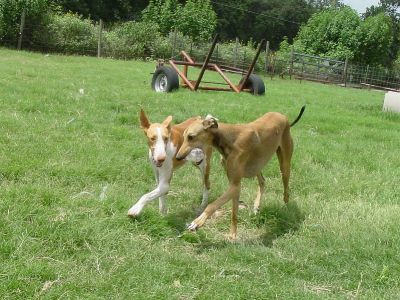 Lola Rouge with Saluki friend Alegria. 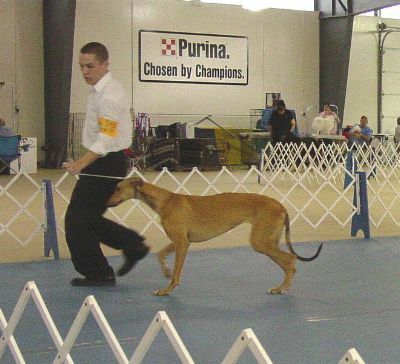 From the farm to the show ring, Lola Rouge does it all. 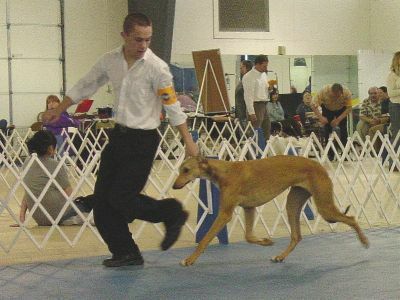 Pictured in the show ring at the United Kennel Club shows, February 24-25, 2007. 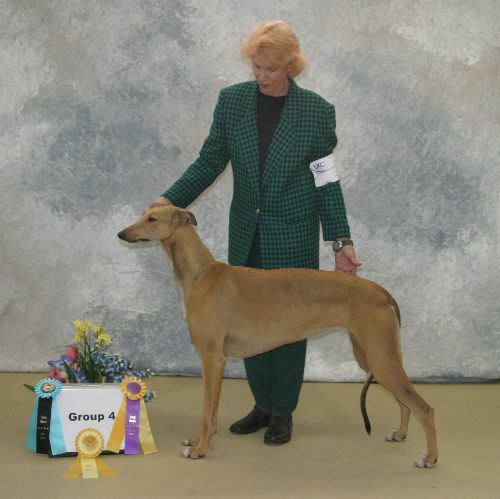 She is lacking two competition wins for her UKC Championship. 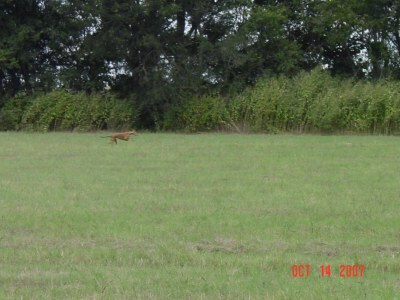 Showing interest in a low flying bird. 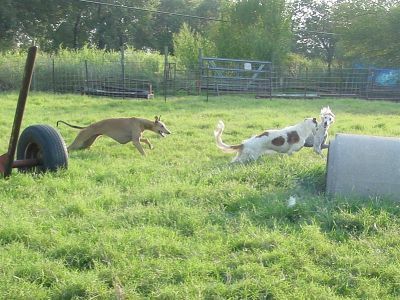 Lola bringing up the rear with Honore and Layla in front. 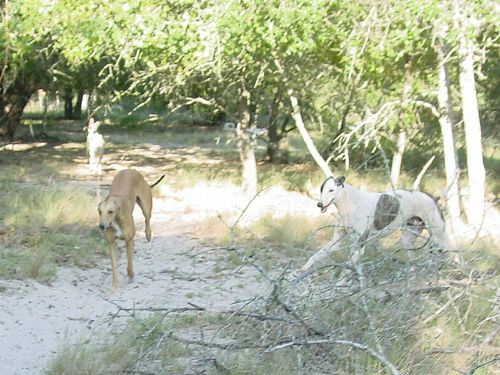 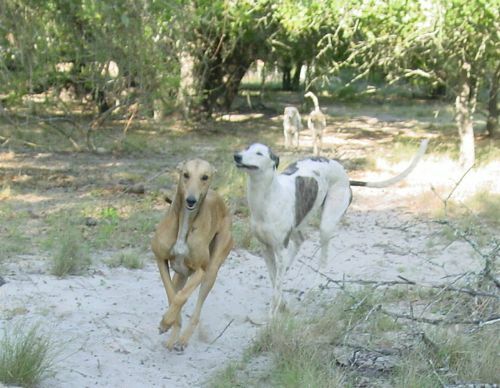 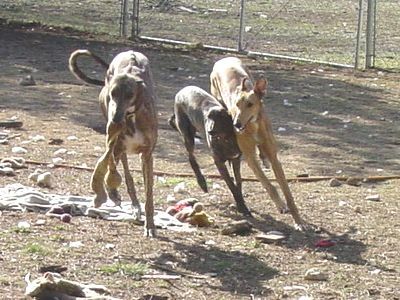 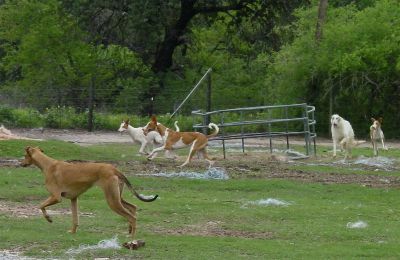 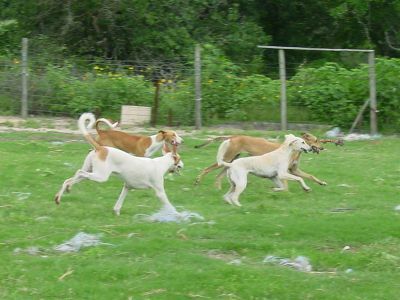 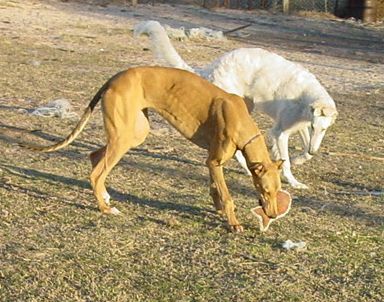 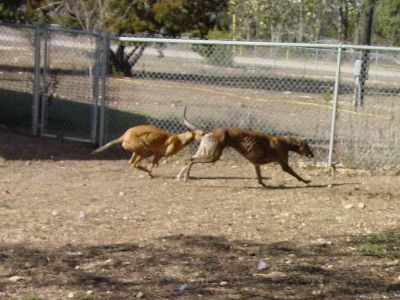 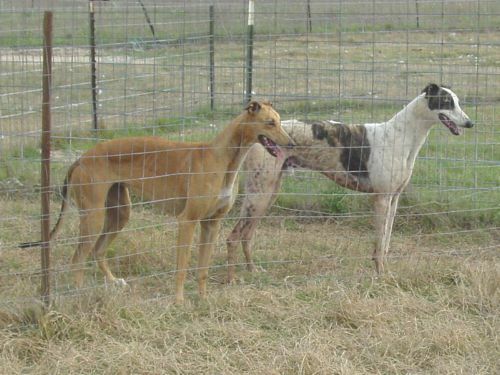 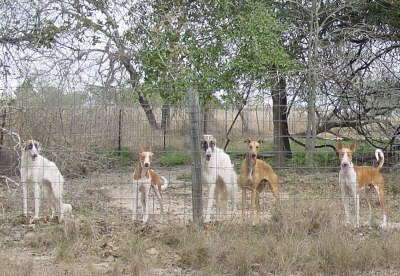 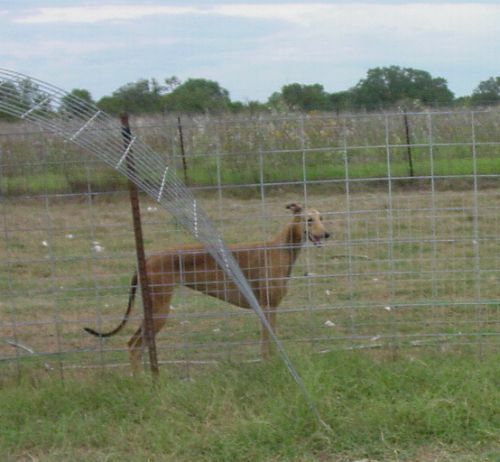 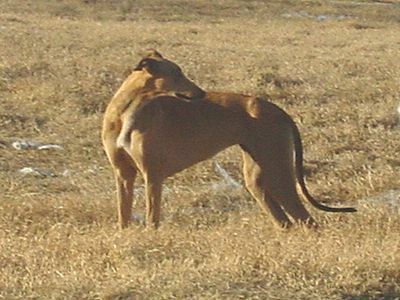 October 12, 2007 found us at lure coursing practice. 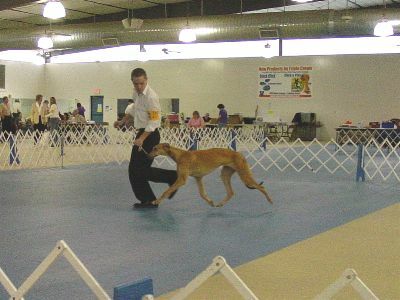 Lola took off like a bat out of he** and then decided she'd had enough half way through the course. 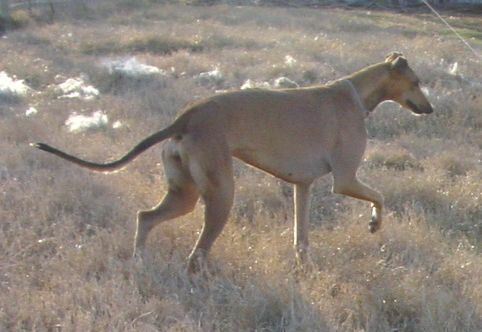 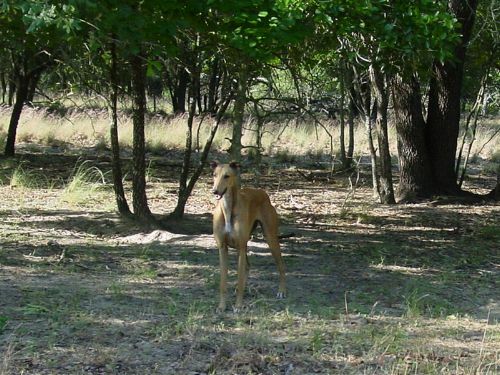 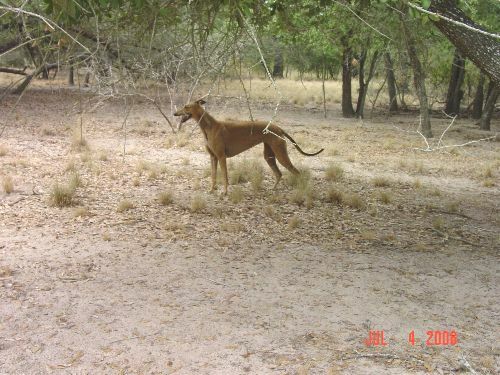 Some dogs, while avid "chasers," do not necessarily take to chasing the artificial lure. 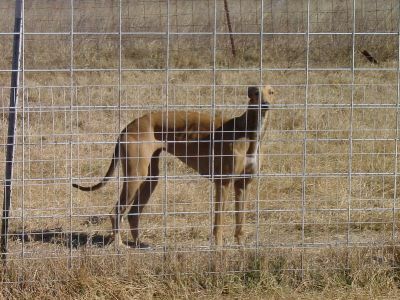 I will try her again at another practice. 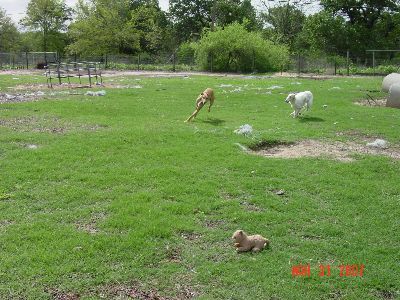 Lola and friends watching me in Shefaro park with the goats. 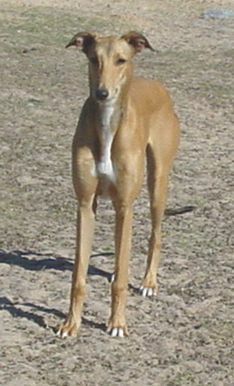 She's showing UKC this week - Jan 25, 26, 27. 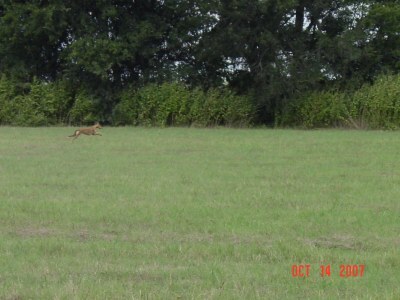 Will post how it went after the weekend. 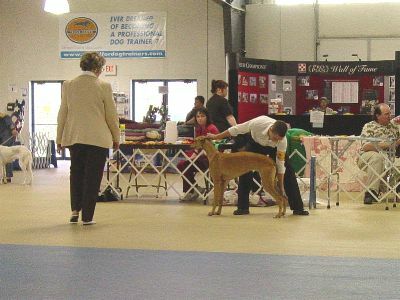 From farm girl to show girl - second competition win at UKC. 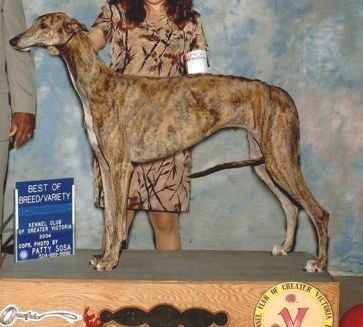 She needs one more for her UKC Championship. 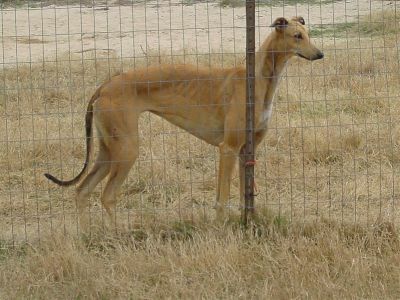 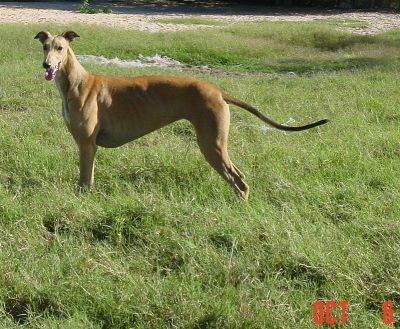 She is a very pretty girl who likes to show, but has no interest in lure coursing. 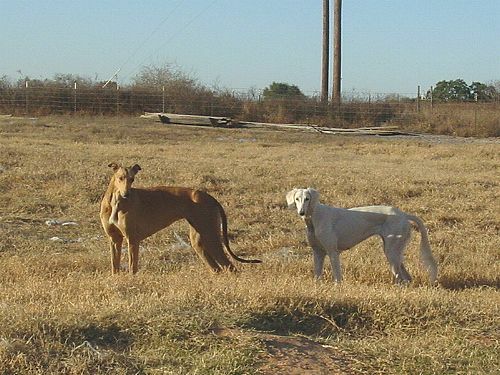 Pictured with her friend Einstein. 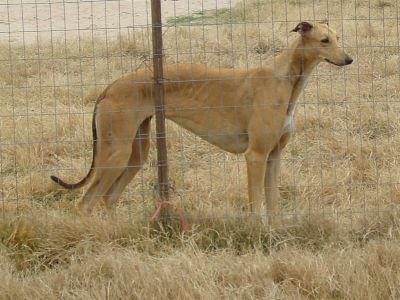 Lola remains available because of her connection to show breeders. 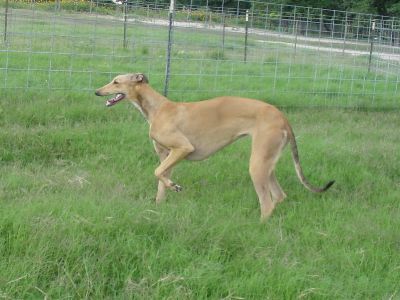 Einstein is not for sale. 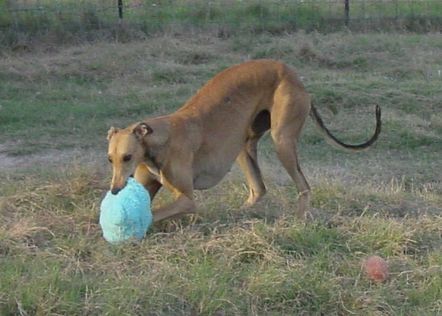 April 13, 2008 Lola at Cleburne. 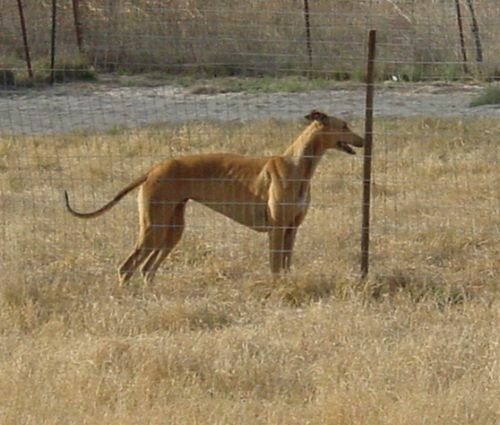 She looks pretty watching the action, but she's not interested in lure coursing herself. 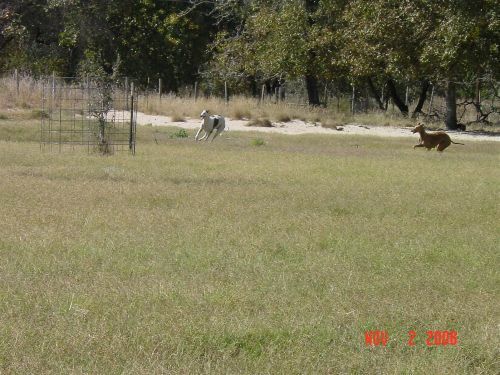 November 2, 2008 running in Shefaro pasture with Einstein. 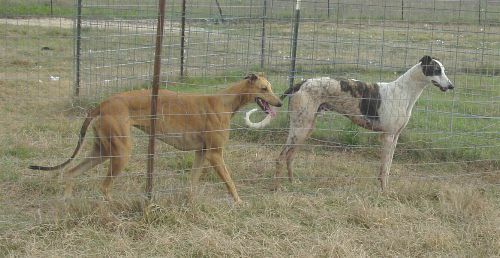 November 6, 2008 her pups are eight weeks and she looks GREAT! 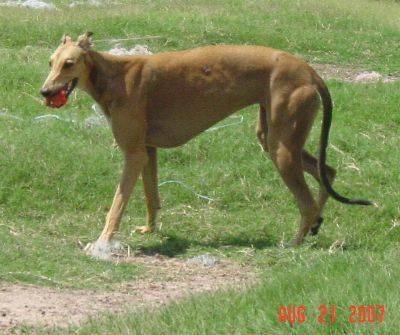 Maternity took no toll on Lola. 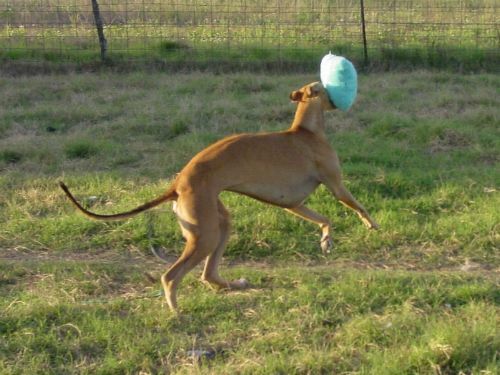 In fact, it was beneficial. 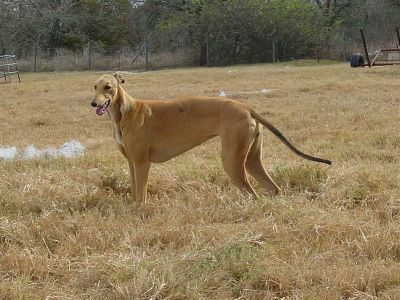 She has matured beautifully. 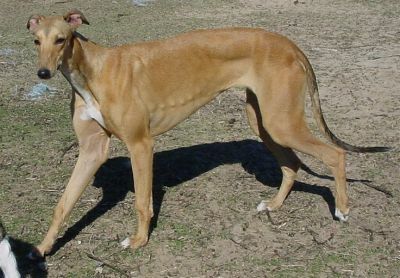 Einstein x Lola's boy Fenix.